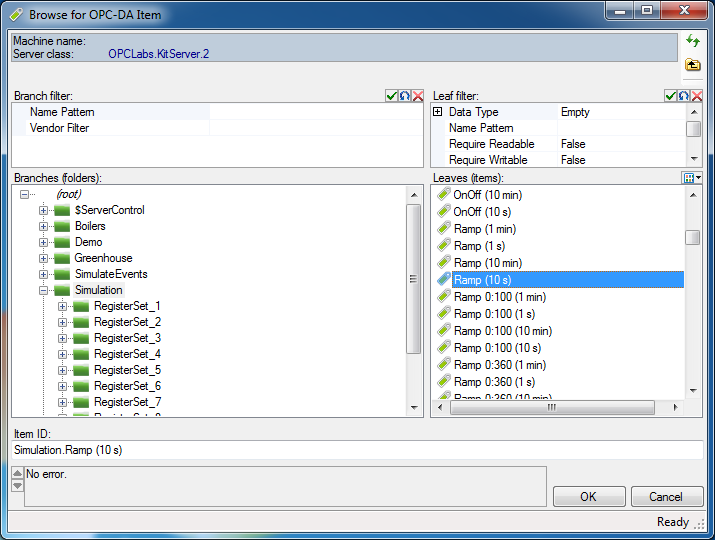 With QuickOPC, you can write OPC client code that browses OPC data from your code programmaticaly, but you an also use a ready-made set of rich user interface (UI) components. The OPC browsing dialogs provide interactive viewing and selection features and make it very simple to integrate such functionality into your application. You can simply drag on of the provided browsing dialog components from the Toolbox, optionally configure its properties, and then invoke the browsing with a single method call. 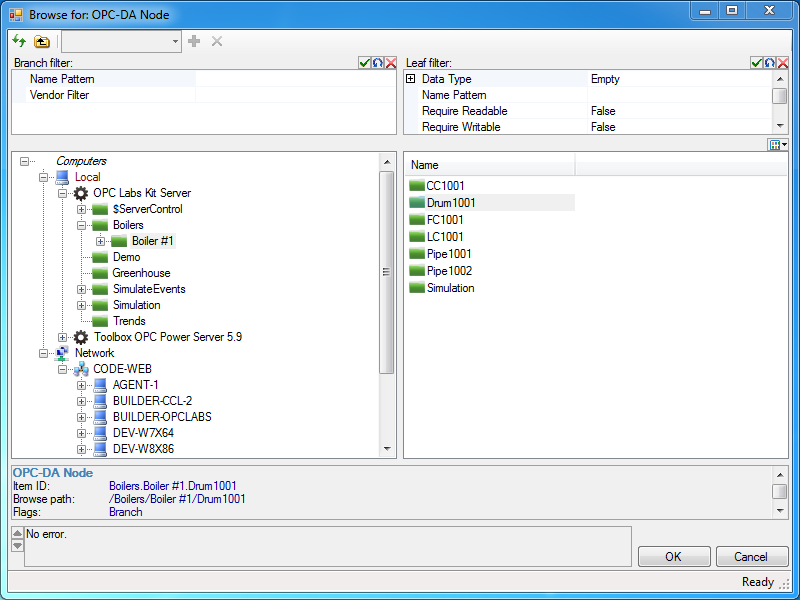 Browsing dialogs are available for OPC clients supporting OPC Data Access, OPC Alarms&Events, OPC Unified Architecture, and even for tasks that combine multiple specifications in one project. There are also "universal" browsing dialog components that can be configured to browse just about anything related to OPC. For the ultimate flexibility, you can pick just the browsing controls themselves, and combine them with other controls on your form to achieve the desired functionality. In total, there are 10 different dialogs available for OPC "Classic", and then there is a separate set of dialogs for OPC-UA. 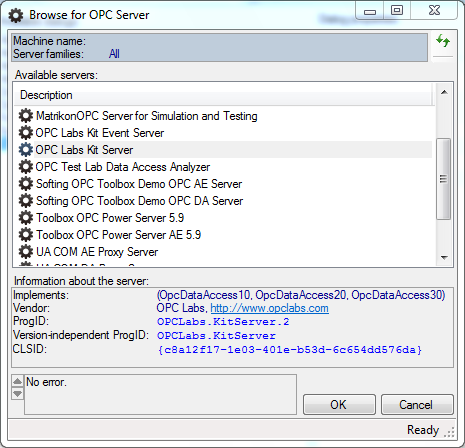 OpcServerDialog: A dialog box from which the user can select an OPC "Classic" server. OpcComputerAndServerDialog: A dialog box from which the user can select a computer and an OPC server residing on it. OpcBrowseDialog: A dialog with various OPC nodes from which the user can select. This dialog can be configured to serve many different purposes. DAItemDialog: a dialog box from which the user can select an OPC Data Access item. DAPropertyDialog: A dialog box from which the user can select an OPC Data Access property. AEAreaOrSourceDialog: A dialog box from which the user can select OPC-A&E event areas or sources. AECategoryDialog: A dialog box from which the user can select from OPC-A&E event categories provided by the OPC server. AECategoryConditionDialog: A dialog box from which the user can select OPC-A&E category available on a specified event condition. AEAttributeDialog: a dialog box from which the user can select OPC-A&E event attributes.